Do you ever look at other people who SAY they are busy and think, “YOU have NO idea what busy is!”? Of course, you never say it to their face (that would just be rude, right?) but you are totally thinking it. Because you are working your side hustle. You’re running your business (or at least in the process of getting it running) WHILE doing the things that every other mom, wife, employee, etc. has to do, as well. I know what it’s like to wake up at 4:30 AM to work on your business before your one-year-old wakes up. I’ve been at the place where my entire house is a disaster because I’m spending every spare moment trying to grow my biz. We (business owners) are truly busy and blessed! Which leads me to podcasts. Because life is CRAZY INSANE ALL THE TIME, I don’t read. Seriously. I think I’ve started five books in the past 2 years and finished one. When I discovered podcasts, it completely revolutionized my world. I can literally be learning more about business, marketing, and getting to hear incredible teaching from some of the people I admire most in the online world, all while cooking dinner or driving to the doctor. Can we say ultimate biz owner productivity!? That’s why I wanted to take some time to share with you the TOP Podcasts that I recommend Virtual Assistants listen to – the ones I know, love, and can’t get enough of. Check out to see if your favorite podcast made the list! This is probably one of the most well-known podcasts for entrepreneurs, and for good reason. With over 33 MILLION downloads, it may go without saying that Pat Flynn is brilliant. He has a way of breaking down complex business components in ways that even new business owners can understand. Pat Flynn covers a wide range of topics, including business, blogging, and lifestyle. Flynn regularly hosts interviews with thought leaders of key industries, making this a great listen for any VA that wants to be exposed to revolutionary leaders and ideas. I have literally listened to EVERY episode of The Femtrepreneur Show. Hosted by Mariah Coz and Megan Minns, these ladies shoot straight when talking about online business and all of the moving parts that comprise one. 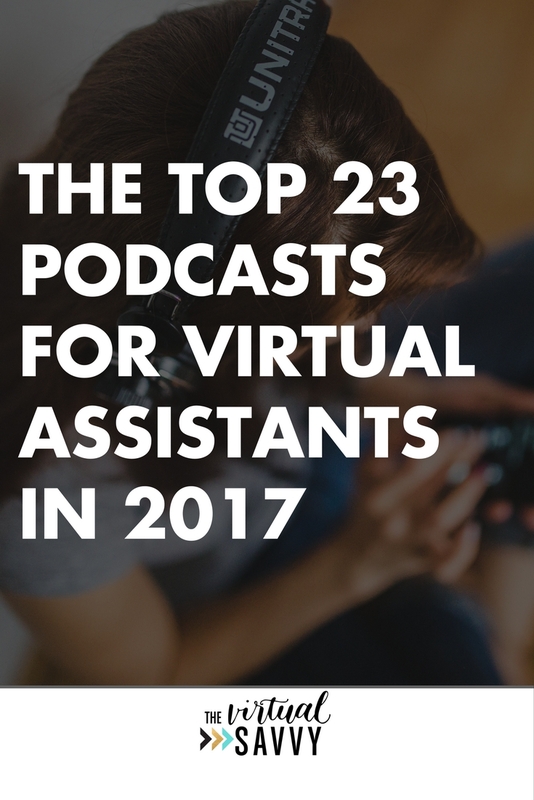 Although declared as, “The Only Podcast By and For Online Course Creators,” there are plenty of good episodes that can apply to VAs too! Some of my favorite episodes that are great for VAs are: #16 How to Create Good Financial Habits, #17 How to Build a Location Independent Online Business, and #20 What Software Do I Need to Start My Business? Amy Porterfield knows her stuff – she has 142 podcast episodes at the time this post was written. She explains EVERYTHING you ever wanted to know about online business, social media, gaining a following, budgeting in your biz, hosting successful webinars and more. I love this podcast because Amy seems like she could be your BFF, chatting with you about business over coffee. Dana is one of the coolest moms I have ever met (virtually met, anyway). With a new episode every Friday, Dana and NJ tackle every issue that hits right at the heart of being a BOSS and being a MOM. This podcast is amazing, because it doesn’t speak only to the business aspects of entrepreneurship, but also about REAL LIFE, like family, parenting, and time management. Emily Thompson & Kathleen Shannon are real, raw, and altogether super fun to listen to. They talk about the topics that are crazy important about being a BOSS, but that no one ever wants to talk about for some reason. They cover everything from budgeting and money management, to setting boundaries, silencing the inner critic, and dealing with haters and bullies in business. John Lee Dumas started this podcast after he realized that no other podcast (at the time) was offering consistent daily content. He set out to change that, by releasing a new interview with an entrepreneur every single day. Dumas explains his reason for doing this was to inspire other entrepreneurs in their journey to finally take the entrepreneurial leap by telling the success stories of real-life entrepreneurs. Dumas’ podcast is enjoyable to listen to for the simple fact that it is casual, interesting, and engaging. David Siteman Garland is the hilarious genius behind this podcast. Listening to an episode will be part the most informative podcast you’ve ever heard, and part stepping into an entertaining conversation with your best guy-friend. You may start listening just to get a good laugh (‘cause this guy is hysterical), but you’ll end up grabbing a notebook and jotting down tons of useful information and tips. Lose the Cape is a podcast for busy, working moms who are juggling raising kids and managing a business. Lose the Cape is for REAL women who are tired of pretending to be superheroes that can easily “do it all.” This podcast covers a wide range of business and life topics, including how to find your identity, time management, how to manage the holidays, how to work with an unsupportive husband, and how to eat healthy while running a business. The Creative Empire podcast is great for VAs that consider themselves creative! Each week, Reina (a life + biz success coach) and Christina (attorney for creatives) take you up close and personal with successful influencers in the creative community and tackle your biggest business hurdles. Their mission is to help creative entrepreneurs think beyond your daily biz so you can make the brave decisions that build your creative empire. The Strategy Hour by Think Creative Collective is an action-packed podcast that contains a ton of resources for online business owners and for VAs! This podcast offers killer strategies and actionable marketing tips to grow your business. In addition to their podcast, their wealth of resources includes written and organized summaries of every podcast, links to third-party resources, and podcast highlights on The Strategy Hour’s website. I actually learned about Zach Spuckler from a Marketing Made Easy podcast episode, but I was SO impressed by his content that I had to check him out! The Heart, Soul, and Hustle podcast brings you real-life tricks for the online marketing industry in super-detailed and easy to understand presentation. I seriously love this podcast! The Create Lounge Podcast was created for the Create Lounge community, and aspires creatives to tap into their creativity, tell their story, and find their community. Creatives assist the podcasters by sharing their best advice for embracing everyday creativity! Topics include VERY VA-relevant themes, such as writing, design, photography, art, blogging, social media, business growth, and personal growth. Virtual Assistants thrive on systems to make all pieces of their business work together. The Systems Saved Me podcast, with Jordan Gill of Personalized Procedures, helps VAs and other entrepreneurs learn how to create and implement systems that work WITH your business, and not against it! Annette Stepanian, hostess of Office Talk, talks about how to design your life and your business on YOUR terms. Not only does she host AWESOME entrepreneurs that divulge all of the details about how they run a successful business, but Annette also gives amazing advice on legal topics, from hiring employees and contracts to filing trademarks. Autumn Witt Boyd is a lawyer for creatives and online entrepreneurs, and you will LOVE all of the legal subjects and advice she has to offer on this podcast! Her range of topics include copyrights, trademarks, and business law info. If you have legal questions about your VA business, definitely start here! Jess Creatives is the woman and business behind this podcast, where she shares Journeys in Business. This podcast is truly inspirational as Jess interviews several LADY BOSSES and discovers what made them unique and successful on their business journeys! Formerly The Business Rescue Road Map and hosted by Stacy Tuschl, She’s Building Her Empire is a podcast for women who want REAL, RAW, and HONEST. With almost 150 podcast episodes at the time of publication, Tuschl REALLY knows her stuff! She talks anything and everything business, from strategy and branding to meditation for success. Podcasters Nicole Hoglund and Samantha Johnston are bringing AUTHENTICITY to the table with this podcast! Hoglund and Johnston are leaders in teaching business owners how to trust their own judgment; VAs can learn from this podcast how to be themselves in business – BOLD and BEAUTIFUL. It might seem strange to include a home podcast about minimalism in this list, but there is SO MUCH to learn from Allie Casazza and Kelsey Van Kirk about how to throw out the “unnecessary” in life AND in business, and to learn how to live and work simply! VAs often help other people minimize + simplify business processes. Lessons in minimalism is a great way to learn a mindset shift – simplifying not only at home but at the office too! The Blazing Creative, with Meghan Maydel & Steph Schertz, boasts two full seasons of 50+ podcast episodes. Each episode packs power punches of advice and wisdom for creative biz owners. These girls love to laugh and they are GIRL BOSSES. Unfortunately, no new episodes will be coming out, but you can still access the full two seasons and grab this wisdom while you can! Powered by The Higgins Creative, Wake to Make is a podcast for Makers. The husband and wife team aspire to inspire, empower, and equip Makers to design your life in a way that works for you. The Higgins Creative encourages you to make your art and then shows you how to make your art work for you. If you are a VA Maker, you don’t want to miss this one! The Creative Biz Rebellion was created by Kelly + Caroline to help creative business owners with their business. Primarily a product biz podcast, they still cover great subjects for VAs ranging from social media, business apps, and shipping, to customer service and blogging. Tara Gentile explores in this podcast what it means to use your creative drive to build a life and business. She interviews creative people to uncover how they earn income, take control of their businesses, set boundaries, and pursue what is most important to them so that you can learn from their strategies and growth! Tune in to listen more about business strategies that you can use to grow your VA biz! Listening to podcasts is a way to increase your productivity and start learning more while your doing your everyday tasks. Want to learn more ways to be productive? 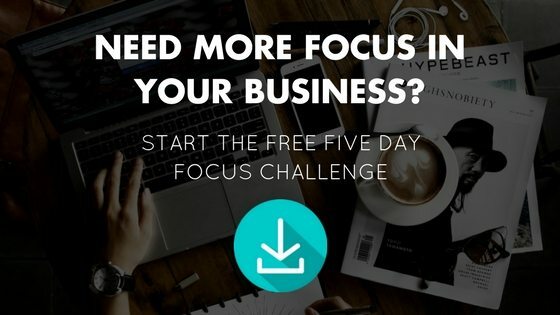 Check out my FOCUS CHALLENGE. 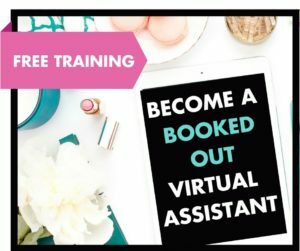 It’s a free five day course that will lead you through setting goals and staying focused on those goals throughout 2017. What is your FAVORITE podcast? Comment below and let me know! Thank YOU. Keep rockin’ it like you do! Abbey! Thank you so much for including She’s Building Her Empire. It is an honor to be in such incredible company. You have truly picked some top notch podcasts! Stacy, thank you for being so great! Thank you for having such an amazing podcast to share! Fantastic Round-up! Great Resource for our Member Entrepreneurs! Also a few new ones for me to listen to! Thank you! 🙂 There are so many amazing podcasts out there!